Common vegetables, listed by carb count, low-carb vegetables to high-carb vegetables. For low-carb eaters, including South Beach and Atkins dieters, this is an invaluable list to both widen and focus your vegetable choices. "I am so sick of broccoli!" complains my friend Tom. Like most of us, Tom eats the same three or four vegetables again and again. He's also losing weight with a low-carb diet. To limit his carb intake, he has eliminated high-carb vegetables like potatoes and winter squash from his diet. 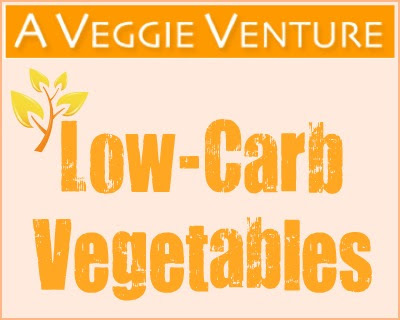 With this list of low-carb vegetables, I hope to inspire low-carb dieters with new vegetable options. Take a look at this list of vegetables, sorted low to high by net carbs – what's new to you? There are so many more low-carb vegetables than broccoli! For easy apples to apples (or would that be asparagus to asparagus?) comparison, unless specified, Net Carbs are based on a serving size of 1/4 pound of the raw vegetable. Net Carbs = Total Carb Grams minus Fiber Grams, a rough indicator of a food’s glycemic index. I define 'low carb vegetables' as those with 10 or fewer Net Carbs per serving. If you're a first-time visitor and follow a low-carb diet, welcome to A Veggie Venture, the food blog packed with vegetable recipes, mostly vegetarian and many vegan. Here, each vegetable recipe includes nutrition information, Net Carb counts and low-carb vegetable recipes are easy to find. You'll also want to check out KitchenParade.com, my published food column. There too, low-carb recipes are all in one place. It's so helpful to be reminded that there is a whole range of low-carb choices. Thanks for this list! Bookmarked! Thanks for the list. What a comprehensive list! Thanks, Alanna. Thanks a lot I just started a low carb diet and I was getting frustrated already. I never actually gave thought to other veggies being low or high carb... I just knew potatoes and sweet potatoes were fairly high in carbs... Who knew? HA HA HA. Thanks for the info. At the end of the day, I think a veggies with a higher carb rating are still better choices than a slice or 2 of white bread and it is still better to fill at least half your plate with veggies (other than potatoes)! I have enjoyed getting to know you through your recipes and tips. Thank you for sharing! Awesome list! I love the way you broke it down. Thanks! You really need to update your info. I can't find ANY nutritional information that even comes close to your EXTREMELY LOW net carb counts!!!! I am very confused as to how you calculated your info. or why you haven't done more research to check your figures. I am confounded that you list CORN, for example, as LOW CARB with the VAST MAJORITY of nutrition sites showing that corn in the amount you claim is in the vicinity of 20-30+ NET CARBS!!!??? Maybe rethink using only ONE resource for your published information. > The first (lower) calculation is for a single ear of corn which yields only a half cup of corn. > The second (higher) calculation is for 1/4 pound of corn which is the standardized serving size here on A Veggie Venture, making it easy to compare one vegetable to another on all the nutrition dimensions. Thanks for the work you obviously put into this site! It was very helpful in showing someone why she isn't losing weight: She invariably chooses the highest carb veggies that have the highest sugar content, such as beets, green peas, POTATO SALAD!!! She's oblivious to how I lost as much weight as I have 31% as of today while she keeps gaining it. It hurts, not being able to hel;p her further. Thanks for the great info - it's appreciated! Of you to post all this info so broken down. Much respect.